“Where did I save this file?” If that question sounds familiar to you -or any less polite version of it- exalead one:desktop is the tool you need. 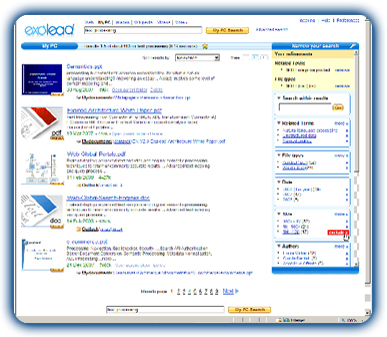 exalead one:desktop belongs to the exalead one:search range of products. 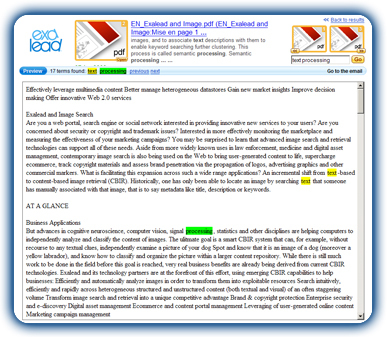 The professional edition of exalead one:desktop enables the ability to search simultaneously on your PC, your enterprise servers and the Internet. exalead one:desktop is also available in a free downloadable version. To get it, click here.To read the Press Release, click here.To get more information on exalead one:desktop product, click here.